Shake up the beginning of your summer by depositing as little as $25 and collecting up to 50 Spins once per day throughout the month of June and get ready to put a new twist to this fun new season! 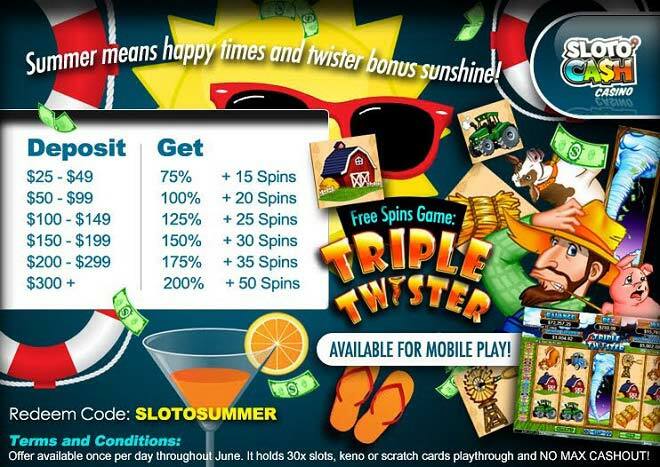 Play Triple Twister and give this June a different spin with an epic storm of winnings! This 5 reel and 50 payline gives you plenty of opportunities to win with two randomly awarded progressive jackpots, a scatter symbol and bonus rounds that will help you bring some heat and riches to your account. Time to track down summer winnings and celebrate the start of one of the most exciting seasons of the year with the help of up to 200% Daily Bonus + 50 Extra spins!